The Goldfinch deserves the Pulitzer Prize; it is epic, magnificent in writing, deep, profound, and a tale woven of grandeur that very few can write. However, it was so dark and void of all hope I longed for it to be over for most of the book. At page 300 I wanted to quit. I kept reading. At page 450 I plunged deeper into the darkness and wanted to quit. I finished it and felt enormous relief. The story of Theodore Decker is wrought with misfortune. He lost the only person who loved him in a traumatic accident and lacked family and structure for most of his childhood. Theo rattled through his teen years with extreme drug and alcohol use to ease the pain. His only friendship in life proved to be a twisted myriad of lies and manipulation. I longed for a spark of hope in the darkness, I longed for an outside light to lead him out of his destruction. Every story needs a struggle, without it you really do not have a story. However, this tale of self-destruction saw no end to the madness. Tartt philosophically explains we have no one outside of ourselves to look towards and that in ourselves is mainly brokenness. I truly believe outside of our selves there is hope. Looking outside of ourselves grants us hope, faith in things bigger than ourselves, and love for others more than ourselves. 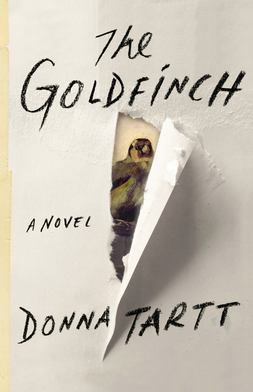 The Goldfinch was an incredible work of fiction; however the dark journey was too much for me to stomach. Hello! Thank you for visiting my blog. I agree, there are way too many fantastic books out there to waste time on things that don’t move you. I love meeting fellow book lovers. Happy Reading! Thank you for visiting my blog! It is nice to meet a kindred soul in the book world! May your next book be a fantastic one.